As US tourists in Israel, a man and his wife were sitting outside a Bethlehem souvenir shop, waiting for fellow tourists. An Arab salesman approached them carrying belts. After an impassioned sales talk yielded no results, he asked where they were from. Looking at her dark hair and olive skin, the Arab responded. "She's not from the States." "Yes I am." said the wife. He looked at her and asked. "Is he your husband?" "Yes." she replied. "I'll give you 100 camels for her." The husband looked stunned, and there was a long silence. Finally he replied, "she's not for sale." 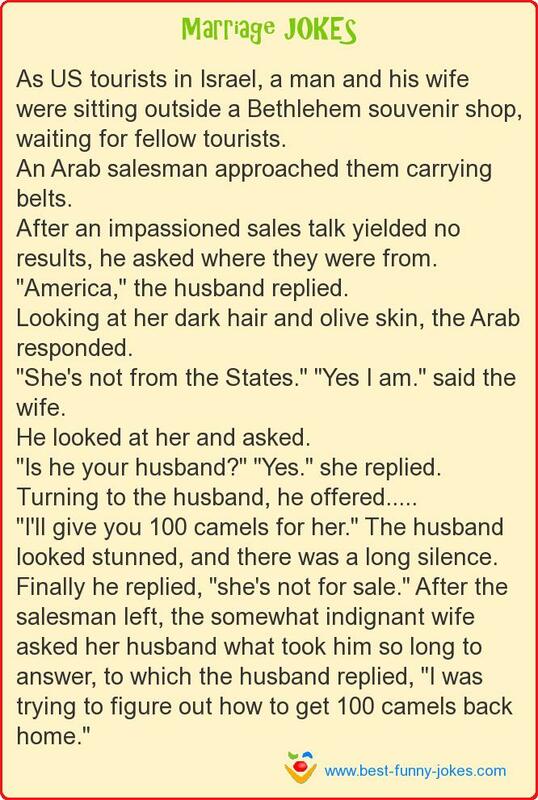 After the salesman left, the somewhat indignant wife asked her husband what took him so long to answer, to which the husband replied, "I was trying to figure out how to get 100 camels back home."